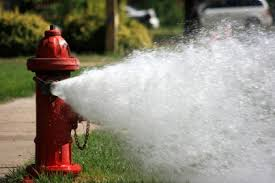 The Public Works staff performs Village-wide hydrant flushing in the spring and fall of each year. This procedure clears sediment from the water distribution pipes and helps maintain water quality; preventative maintenance is performed on the hydrants and valves as well. Signs will be posted in the neighborhoods to alert residents when flushing will occur in that area. Please drive carefully if you observe flushing crews working in your area. During hydrant flushing, it is possible that temporary discoloration will appear in the water due to loosened iron, sediment or air bubbles. Residents should refrain from washing laundry or using a dishwashing machine when flushing is occurring in or near their neighborhood as the temporarily discolored water may cause staining. Also, a more pronounced chlorine taste or odor in the water may be noticed just after flushing. This is because free chlorine is more prevalent in the incoming distribution water used for flushing. When flushing is completed, it is recommended to run the cold water taps until the water appears clear prior to use. This will help clear out any sediment and air bubbles that may have entered the water lines inside the home. Any increased chlorine taste and odors will dissipate after a couple days. For drinking water, filling an open container and storing it in the refrigerator will also expedite the removal of increased chlorine. If water pressure seems low, check faucet screens for trapped particles. Also, hot water tanks may be flushed by running the hot water tap for a few minutes after the cold water clears. Questions or concerns can be directed to the Public Works and Engineering Department at 847-515-5222.